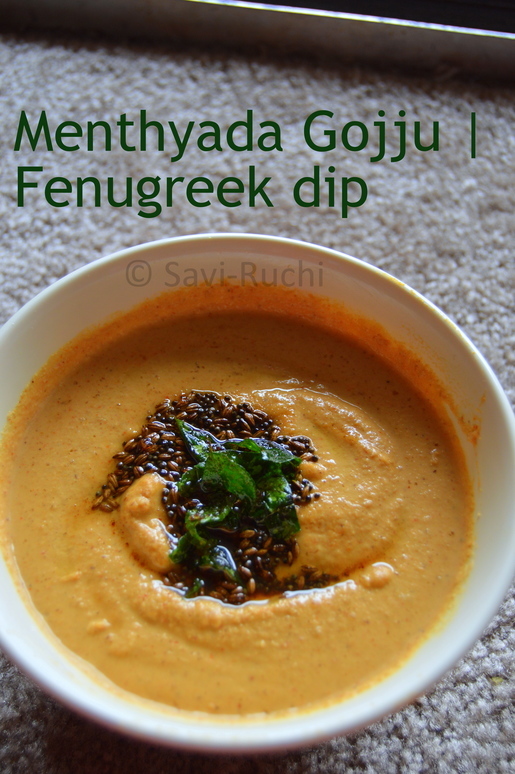 Menthya Gojju is a Malenadu Specialty. Malenadu is a region of Karnataka State in India. It literally translates to "Rain Land". I belong to this region and I love love love this place. The fog covered mountains, the dense evergreen forest and the misty air are what this region is famous for. The moment I write or think about Malenadu, I literally go to the dreamland. It takes sometime for me to come back to reality. I wish I could sit near the paddy fields, I wish I could soak in the rain, and I wish I could watch the fog covered, lush green mountains until my heart desires. I wish I go back there soon.......You can search for the Malenadu or Malnad region pictures to believe me. Now back to the recipe. This side dish can be served with rice, dosa, pundi gatti (unde), idli or chapathi (Indian flat bread). Heat oil in a wok or sauce pan. 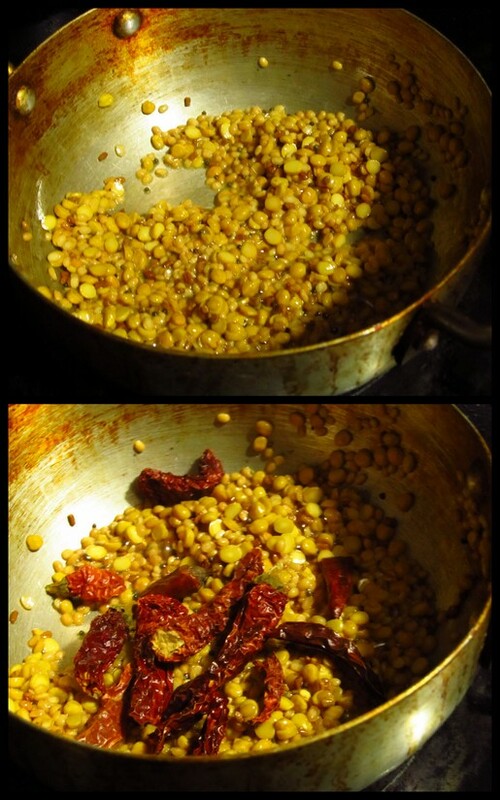 When oil is hot, throw in the channa dal, and urad dal. 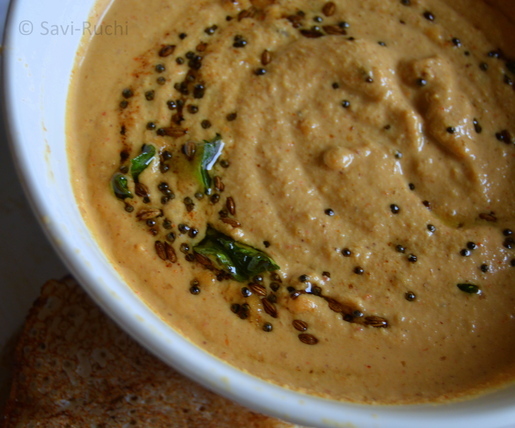 Add the fenugreek seeds, mustard seeds and roast again for couple of minutes. Break the dry red chili and add it to the wok. Roast again until the raw smell of the chili is gone and chilis are nicely roasted. 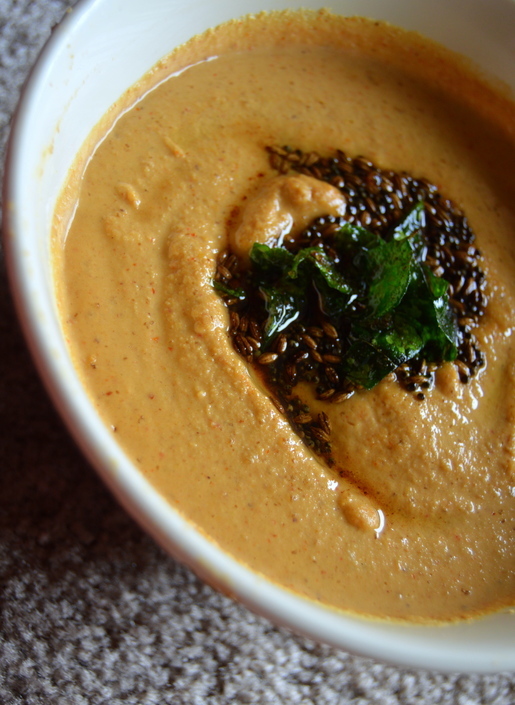 Once cool, grind the roasted spices along with coconut, jaggery, salt, and tamarind extract. Add little water at a time to make a smooth but thick paste. Scoop the chutney/dip. Prepare the tempering. Heat oil in a small wok. When oil is hot, throw in the mustard seeds. When seeds crackle, add the cumin seeds. When cumin seeds turn golden brown, throw in the curry leaves and turn off the heat. 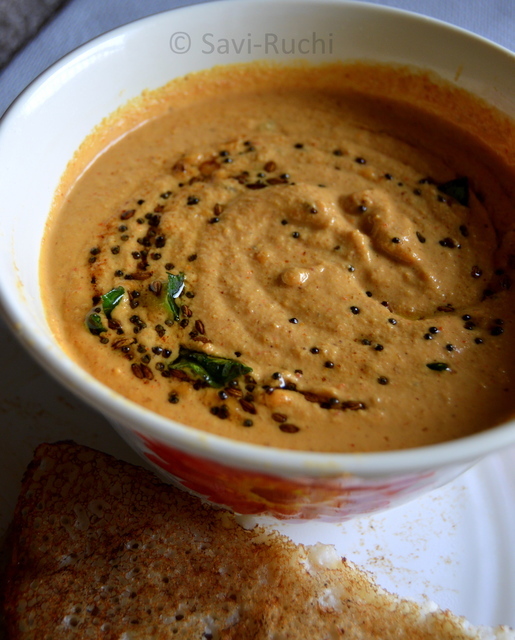 Add the asafoetida to the tempering and pour this tempering over the chutney/dip prepared. Mix it well and serve it. You could adjust the spice according to your needs. 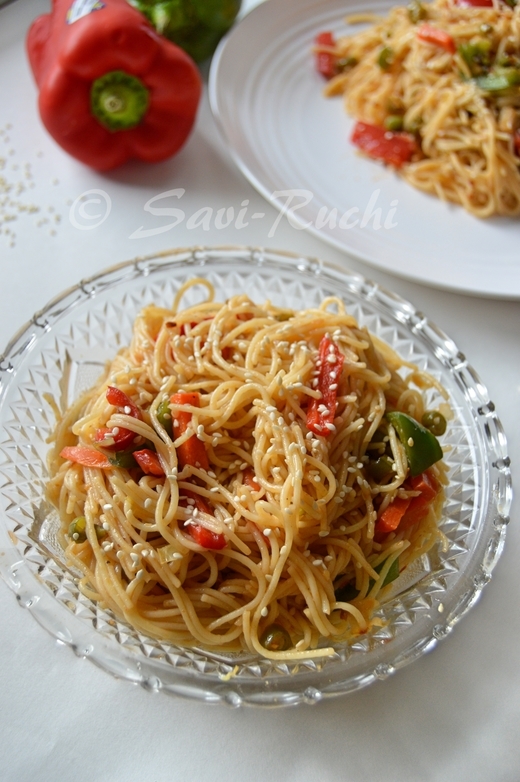 I normally add Kashmiri or Byadagi chilies for their color and mild flavor. You can make this chutney with dry coconut or coconut powder too. Coconut powder is easily available everywhere. I sometimes add finely chopped onion to this dip. I do not blend the onion, but after the chutney is made, I mix in the raw onion. It tastes very yummy.